The sleekly-designed Formulate Tablet Stand 2 is a freestanding tablet kiosk that makes it easy to encourage interactivity, present information and engage customers in any space. Featuring a sturdy aluminum tube frame, weighted base for stability and pillowcase fabric graphic, assembly is easy! 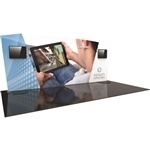 With a graphic that narrows at the center where the iPad attaches, providing space at the top for eye-catching, Tablet Stand 2 is a perfect addition to any trade show, event or retail environment. 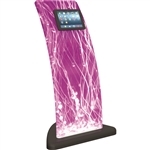 Make an impact with Formulate iPad Kiosk 02! iPad is not included in kit.The Formulate tension fabric monitor tablet stand 2 is a great way to display your multimedia message and engage with your clients utilizing the latest innovations and technologies!